When Japan entered World War II on the side of the Axis powers. Australia found herself in a precarious position. Most of her small army was engaged in the Middle East and her vast and sparsely inhabited country presented a most attractive target to a warlike race seeking living room. Although there was a well established arms factory in existence at Lithgow. Australia was not then a very industrialized country, but she began to produce arms as a matter of hard necessity. One of her first efforts was an Australian Sten. known, perhaps inevitably, as the Austen, but although by no means a bad weapon it was never popular with the Australian Army. The first locally designed sub machine gun was the work of Lieutenant E. Owen, of the Australian Army, which was adopted in November. 1941 and put into production immediately. It was a well made weapon, if a little on the heavy side, and was an immediate success with the soldiers. It was of fairly orthodox design and its point of balance was immediately above the pistol grip which allowed it to be fired one-handed if necessary. The magazine was vertically above the gun and although this involved offset sights the idea was popular because it helped when moving through thick cover. 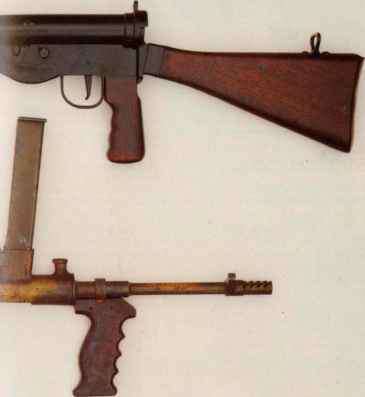 All Owens were camouflaged after 1943 and provision was made for a bayonet in 1944 The Owen was a thoroughly good weapon and was still in use in the 1960s.